This solid plastic can be trusted for household objects as well as engineered technical pieces. Apply some force and this plastic is slightly flexible but not frail, and won’t soften when warmed making it ideal for moving parts in machinery. Raw ABS prints are ivory white and easily colored. 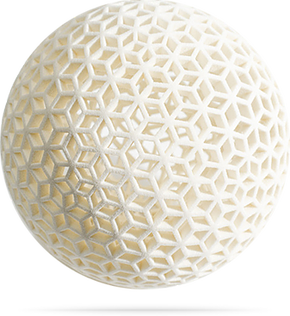 ABS is available in many finishes from glossy, to smooth, to lightly textured making it a jack-of-all-trades in the world of 3D printing. PLA is a rigid, glossy plastic that’s naturally transparent though it’s easy to apply softer textures by gently sanding it. You can also apply vibrant colors. PLA can be trusted for visually stunning 3D prints, plus it’s not crude-oil based plastic meaning it’s more sustainable than plastics like ABS. However don’t use it in machinery as it is susceptible to softening when heated. Nylon is your best plastic for industrial parts. When printed in strong, thick pieces nylon can be trusted to withstand extreme heat way over 100°C and still retain its strength and shape. Naturally it has a beige hue, though it can be vibrantly colored. Nylon takes on another life when printed thin, becoming a flexible and durable material, again perfect for the toughest jobs. Lighter than any other metal, aluminum is a breeze to carry around without compromising strength. From furniture to knick-knacks, aluminum can do it all. In the real world, aluminum is sturdy enough to reinforce airplanes at only a fraction of the weight of steel. Plus it’s beautiful. Aluminum naturally features a bright silver color and can be polished to a mirror-finish. Just be careful handling it over the stove. Aluminum can withstand high temperatures but heats up faster than any other metal, leaving nasty burns if underestimated. You can plan to use aluminum every day and your prints will be portable and will outlast plastic. Resin’s a stiff, precision plastic for the highest detail prints. Your prints will be smooth and translucent or white, with options for colored tints or to polish your print further. Resin’s precision and beauty come at a cost though. This rigid plastic looks great for prototypes and models with its smooth, glossy, & creamy white finish. VeroWhite is mostly for looks though, as it is not as durable as other plastics so you may not want to put your print to work every day. Transparent is a type of regid resin that is used to produce very detailed prints with a glossy look. As the name implies it is transparent. Prints will come out smooth and shiny, and it will remain stiff unless heated. Transparent is water resistant but not waterproof, so it may degrade if constantly submerged. VisiClear is a plastic used for surgical precision in prints, where attention to detail is key. Visiclear allows you to create a perfectly formed print, usually reserved for the final prototype of a product. Its smooth finish looks professional and its base coloring is a slightly translucent white, meaning it can be colored to stunning effect. It’s not cheap but it can create strong, durable, and form-fitting prints.